Sometimes, as a visitor to an area, you manage to avoid all the touristy, commercial stuff and meet the local people and live as they do. This is the goal of our adventure and has been challenging at times. But not yesterday when we decided to drive to the end of Cape Fear. 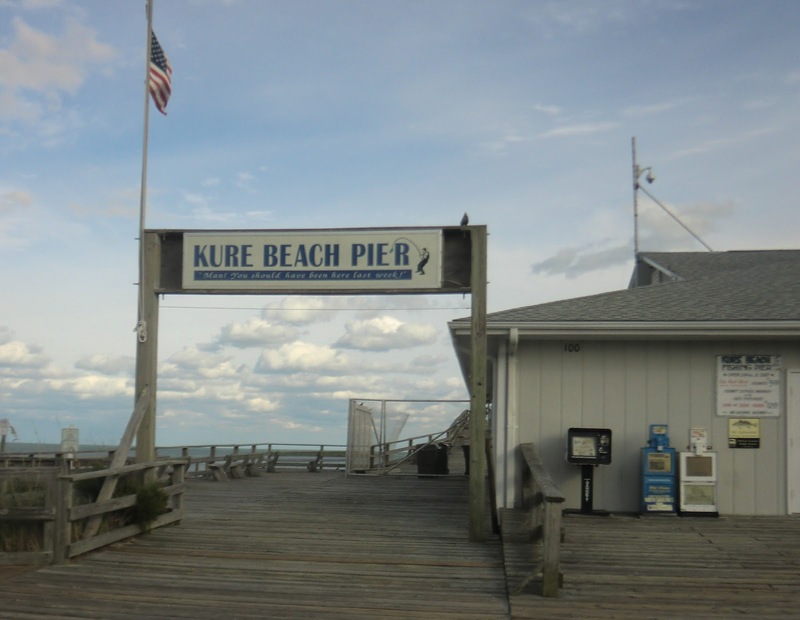 By accident we stumbled upon Kure Beach - one of the most real places we have visited on the US Atlantic Coast. 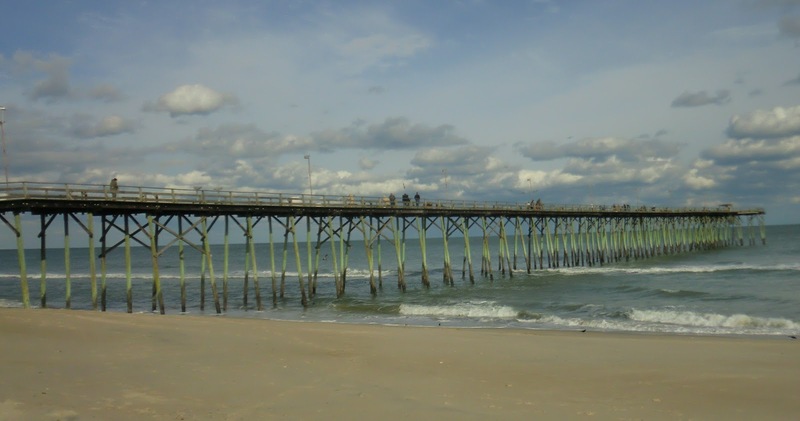 The buildings on the street to the pier, the fishing pier and the beach are all owned by one man - his family purchased the area in 1926 and has maintained control of it ever since. 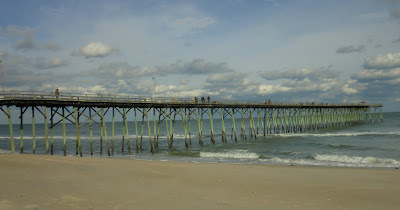 The main activity here is fishing - either from the pier or in the surf. It was cold here yesterday so the beach was deserted. I got a kick out of the woman sitting beside her husband, bundled up against the cold, reading a book. As it turned out, only one fishing rod per person was allowed - she was suffering so her husband could have two. 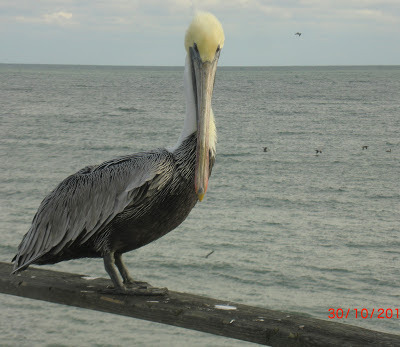 The fish folks were catching appeared to be small but a few were keepers and this fellow was patiently waiting for scraps at the fish cleaning station. The pier was quite long - a sign at the entrance said that you would walk 1 mile if you walked out and back 3 times. There was no charge to enter the pier although you had to do so through a shop that sold fishing equipment and touristy junk from China - the one attempt we saw to attract tourism $$. If you wanted to fish the charge was $5 for the day. 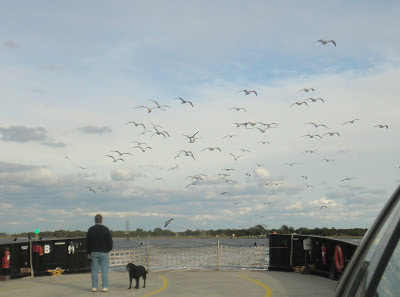 When we left we continued driving to the end of the road and took the ferry across the Cape Fear River and drove back to Wilmington. These seagulls followed the boat with the hope of being fed but would not get too close because of Tara. Some kids were having fun feeding them so Tara went back in the car. All in all, a great cold day at the beach. We've been considering Cedar Key. Is there much to do around there. Golf?